It's been a while since I did a Where In The World Are Paul and Kimberly blog post, so here's one from a trip we did at home yesterday. We took the Bainbridge Island ferry across Puget Sound and toured the area around Sequim, WA to see the lavender farms and coastal scenery. 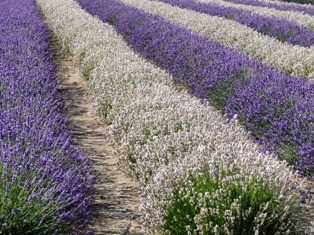 Here's an example shot of the two-tone lavender fields at Purple Haze lavender farm. I've uploaded the whole album to Facebook – check it out at http://www.facebook.com/album.php?aid=2031434&id=1293146061&l=b050bc54c9 – no login required. A new whitepaper has been published that comprehensively covers the Resource Governor feature of SQL Server 2008, written by fellow MVP Aaron Bertrand and SQL PM Boris Baryshnikov. I read through this a while back (but didn't have the bandwidth to do a full technical review) and it's an excellent whitepaper with lots of code examples and in-depth explanations. Check it out at http://download.microsoft.com/download/D/B/D/DBDE7972-1EB9-470A-BA18-58849DB3EB3B/ResourceGov.docx.